George Kohlrieser is an organizational and clinical psychologist. He is Professor of Leadership and Organizational Behaviour at IMD and consultant to global organizations around the world. His research, teaching, and consulting activities are focused on high performance leadership, high performance teamwork, conflict management, change management, dialogue and negotiation, coaching, stress management, work life balance, and personal and professional development. He is also a Police Psychologist and Hostage Negotiator focusing on aggression management and hostage negotiations. Building on lessons from 40 years as a psychologist and hostage negotiator, he works with companies and organizations based all over the world and serves on the advisory board of the Neuroleadership Institute. He focuses on the neuroscience behind high performance leadership and teamwork, conflict management, change management, dialogue and negotiations, stress management, fulfilling potential and playing to win. George is Director of the High Performance Leadership (HPL) Program, an intense six day IMD program for experienced senior leaders. Professor Kohlrieser is founder and director of Shiloah International, a consultancy offering integrated programs to a wide range of organizations. He has worked in some eighty-five countries in North and South America, Eastern and Western Europe, Middle East, Asia, India, Africa, Australia and New Zealand. Professor Kohlrieser completed his doctorate at Ohio State University where he wrote his dissertation on cardio vascular recovery of law enforcement leaders following high stress situations. His research has made significant contributions to understanding the role self-mastery and social dialogue has in helping leaders sustain high performance through life long learning. He is past president of the International Transactional Analysis Association, San Francisco, California. ITAA is a non-profit scientific organization established to investigate and promote the use of transactional analysis (TA) in psychotherapy, education, business and in other fields of human interaction. In addition, George is Associate Clinical Professor of Psychology, Wright State University, Dayton, Ohio, adjunct faculty member of Union Graduate School, Antioch, Ohio, adjunct faculty member of Fielding Institute San Francisco, California, adjunct faculty member of Zagreb University, Croatia. He had his own highly acclaimed radio call-in talk show in the US for over 10 years. This program was a combination of offering help, giving information, confronting real life issues, and entertainment. George is known as a very engaging teacher, a highly sought after motivational speaker for conferences and keynote addresses. He has consulted for the BBC, CNN, ABC, and CBS and appeared on many radio programs. His work has been featured in the Wall Street Journal and other leading newspapers and magazines. Among the many global organizations for whom he has presented programs and provided on going consultation: Accenture, Cisco, Coca-Cola, HP, IBM, IFC, Morgan Stanley, Motorola, Nestle. 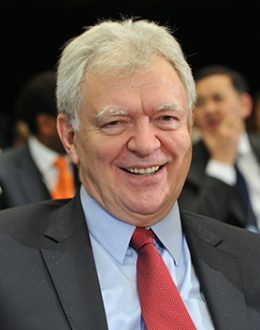 In 2010 Kohlrieser received the BrandLaureate International Brand Personality Award from the Asia Pacific Brands Foundation (APBF) for his contribution to the field of high-performance communication and in 2011 he won the global European Case Clearing House (ECCH) Hot Topic Case Award for Renewable and Sustainable Energy, Technology and Development.